Showered With Love - Sculpture - by Doug Hyde // £379.96 - 15% off. What better way for Doug Hyde to show how he represents love, than for one of his human characters (in the instantly recognisable blue colour) and the black dog stepping out a rain shower and shielding his canine friend from the rain, as they enjoy an autumn walk in the park. 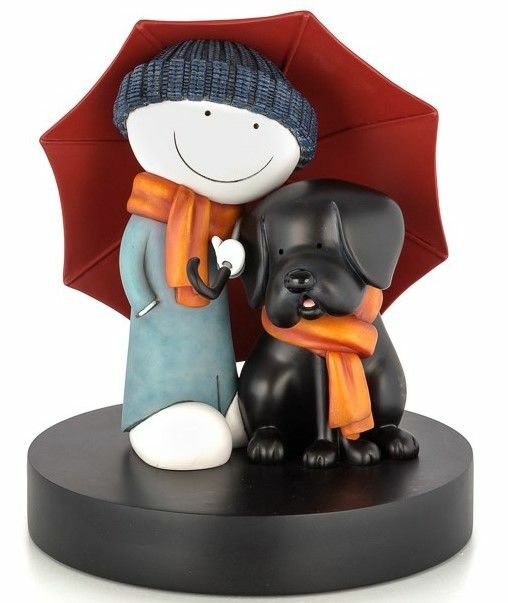 A heart warming resin sculpture of friendship and happiness, did you notice the matching warm scarves keeping our heroes warm? such a lovely touch. The orange of the scarves beautifully contrasted against the warm, rich, red tones of the umbrella - the colour of course of love. This new limited edition sculpture is finished off perfectly with a smooth, spherical, black base and over is small and compact edition to Doug’s huge range of sculptures! Since its launch this has been a best seller in galleries.